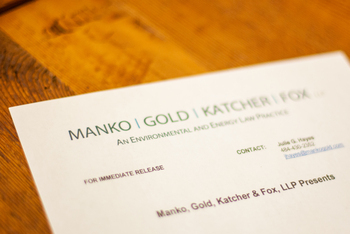 Philadelphia, PA (November 29, 2011) - Suzanne Ilene Schiller and Kate Campbell, litigation partners with the environmental, energy and land use law and litigation firm, Manko, Gold, Katcher & Fox, LLP (MGKF), will participate on a panel on "Medical Monitoring & Toxic Tort Claims: Preparing for the Future in a Post-Dukes Environment" for the American Law Institute-American Bar Association. With Schiller moderating, Campbell and other panelists will discuss the current state of the law on medical monitoring claims, and will address whether and under what circumstances the class action vehicle is appropriate for such claims. The panel will also look at the viability of medical monitoring if such claims cannot be easily brought as class actions, but must instead be pursued as individual, single-plaintiff cases. The teleseminar will take place on Thursday, December 8 from 1:30 to 3:30 p.m. ET.